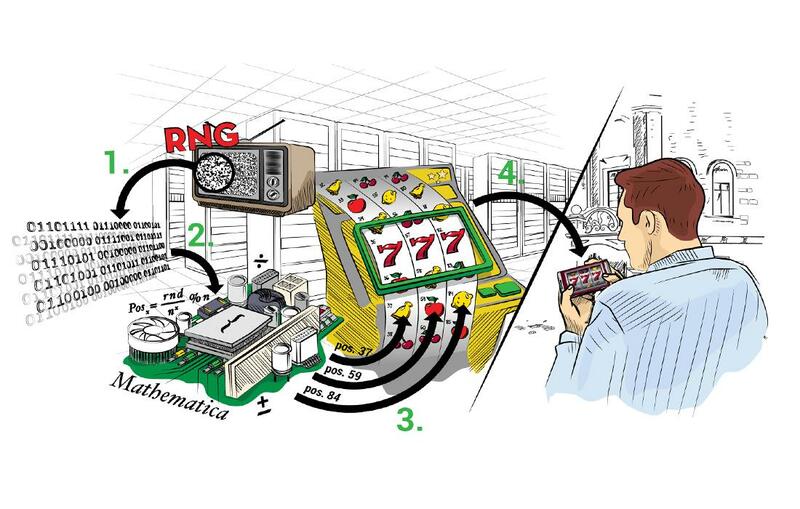 A simple one-armed bandit style slot with a four-tiered jackpot system rather than a bonus game. It plays well with high volatility and an RTP of 96.37%. 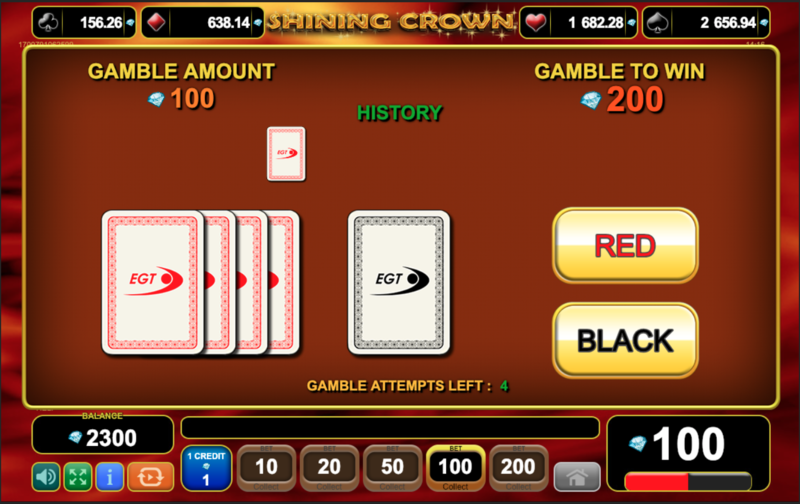 The decorative theme for Shining Crown from EGT is that of a classic slot machine. The usual one-armed bandit symbols of lucky-7s, bells, cherries and other assorted fruit make an appearance coupled with the titular crowns for a Wild symbol. It is a time honoured design and works as well as any of the numerous similar games cashing on on the caché of old school designs. The graphics are lovely, high def symbols roll around well animated reels. The sound design is in keeping with the theme – i.e. very basic. There is no music and the soundtrack is largely a kind of mechanical whirr when you spin the reels and a pleasing thunk when they stop. Unfortunately, it is all a very glossy version of a type of slot we’ve seen hundreds of times before. That said, it does its version extremely competently. The gameplay is extremely simple. In the absence of Bonus symbols the main deviation from the usual "push button, lose or win money, rinse, repeat" style play is the jackpots (see below). There is also a red/black gamble option just in case you want to up your variance in what is already a pretty high-variance game, but even this feels very bog-standard when compared to all the other games out there. 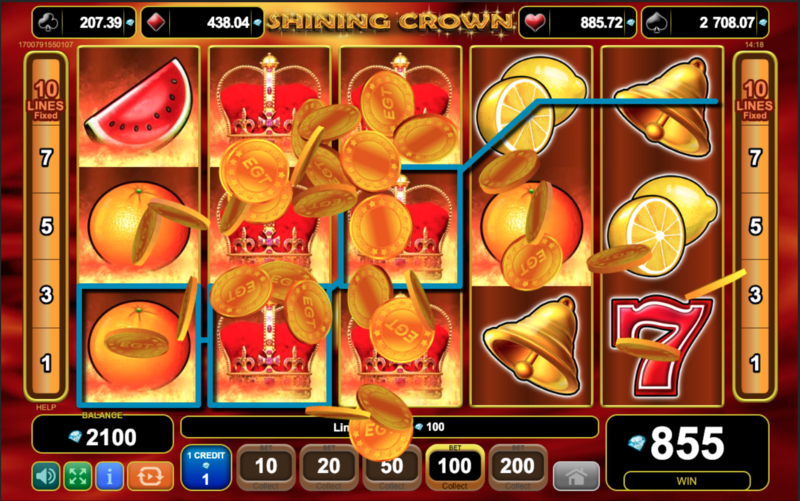 Rather than the usual bonuses triggered by hitting a combo of symbols, Shining Crown offers instead a kind of hybrid bonus and jackpot system. They call this the Mystery Jackpot. 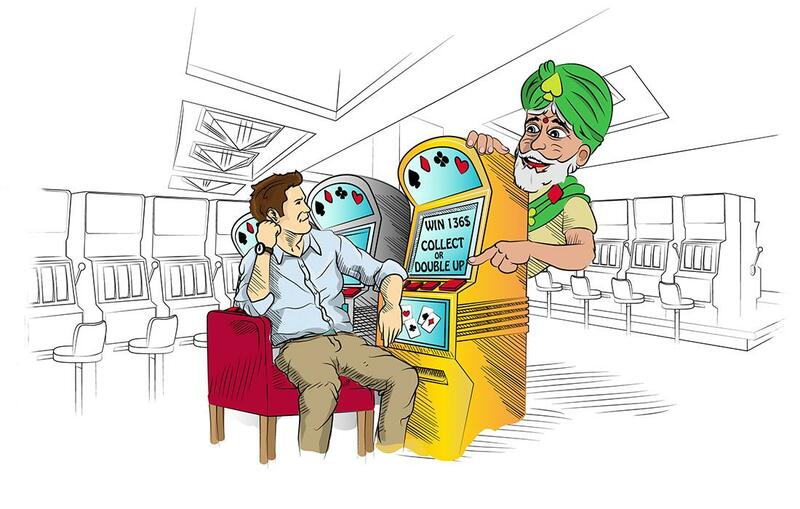 There are four jackpots – one per suit. These take a small contribution from each bet made per spin by all players of the game and are constantly building up at the top of the screen you play in. Every now and again random spins get awarded the jackpot. If you are lucky enough to be rewarded one, then a new bonus game opens up. The bonus game is made up of twelve face-down cards (three of each suit). You turn over the cards until you reveal three of the same suit. You are then rewarded half the amount of the jackpot you won. 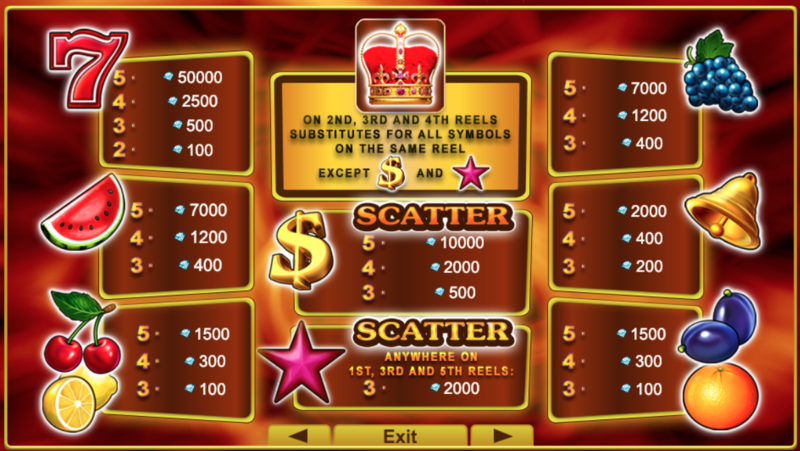 The jackpots grow at different rates so usually, the Clubs are the smallest and Spades the largest, though as in the image below where the diamond jackpot was recently hit, your mileage may vary. In addition to this bonus game, Shining Crown has a Wild symbol with a crown on it. This plays as any symbol but the two Scatter symbols. It also expands to cover the whole reel if it helps you to form a winning line. One of the scatters is a Standard Scatter. Hit any three, four or five of this symbol to win 5, 20 or 100 times your bet per spin respectively. The other is a Special Scatter (star symbol) you have to hit three of these on the only three reels it appears in order to win a prize of 20 times your bet per spin. The RTP of 96.37% is around the rough average for the industry and with a range of 10 to 600 coins per spin, you can get a decent range sizes for your bet per spin by altering the value of the coins. Symbols are often stacked so hitting combos is rarer, but do tend to be fairly large when you do hit a winning combo (or rather "winning combos"). 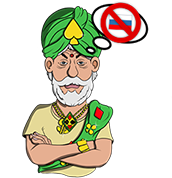 The result is that playing Shining Crown can result in highly-volatile results for your bankroll. You’ll want to come to the table with enough cash to ride out the long gaps between wins. Shining Crown is a pretty simplistic game to be sure, but the high volatility and average RTP mean that it plays pretty well with some of our favoured strategies. Apart from that, the visuals are decent. In fact, the main disadvantage of the game is that the bonus game isn’t terribly exciting to play most of the other features are pretty solid.